All products on the market are required to meet certain safety standards. If someone suffers injury or death because a product they used was defective, or because its potential dangers or correct operating instructions were not adequately explained, the manufacturer may be found responsible and required to pay damages to the victim or his or her family. Unfortunately, companies and manufacturers place unsafe products on the market every day. It is even more unfortunate when an unsuspecting consumer is injured by one of these dangerous or defective products. Claims arise when a product has a design, manufacturing or other defect or when the manufacturer fails to warn consumers of hazards the product may present. Often times, financial restitution is not the ultimate goal of plaintiffs who pursue product liability suits. It is the prevention of future pain and suffering that motivates their claim. Product liability cases have been instrumental in removing dangerous and defective products from the stream of commerce. In many instances, by forcing the removal of dangerous and defective products, others have been prevented from being injured or killed. 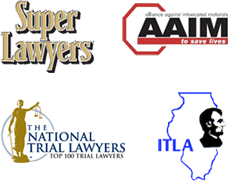 If you or someone you know has suffered a personal injury due to a defective product, contact the Chicago personal injury attorneys at Nemeroff Law Offices. At Nemeroff Law Offices we work with insurance companies and other parties involved in your case to make sure all your needs are handled appropriately.